Students may get to make Student Government Board’s constitution gender-neutral in next week’s election, the Board announced Tuesday night in the William Pitt Union. 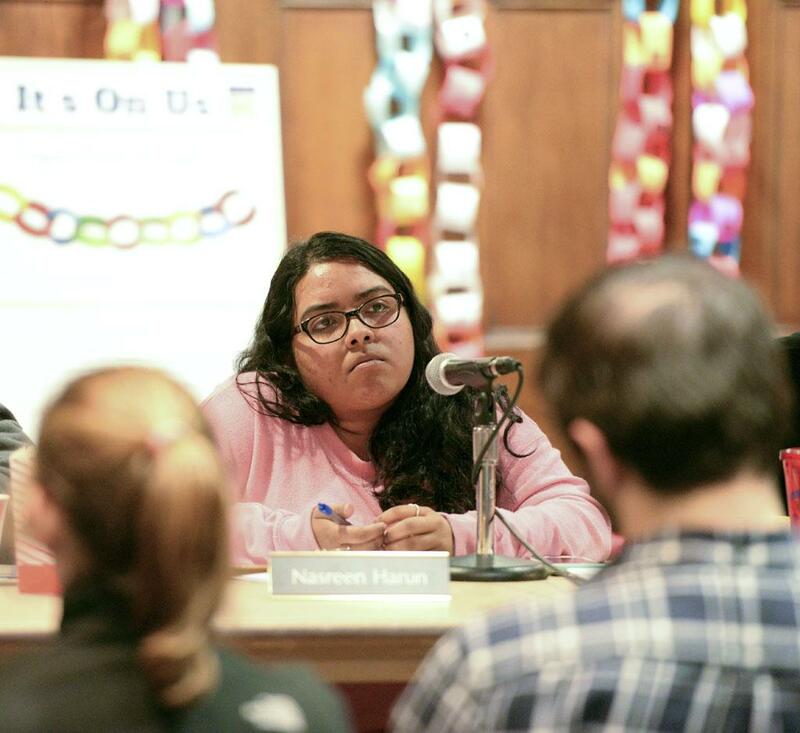 President Nasreen Harun announced at SGB’s weekly meeting that the Board would establish a review committee to propose changes to SGB’s constitution. Harun said the Board hopes the committee will consider changing grammatical issues, the GPA requirement for Board members and the use of gender-neutral terms. The constitution currently includes five instances of gendered pronouns. During SGB elections next Tuesday, the committee — which is made up of students who do not belong to SGB, including Matthew Heiges, Iris Matijevic, Marcus Robinson and Harinee Suthakar — will propose the changes to the student body in a referendum vote in the election portal on my.pitt.edu. According to election rules, at least 3 percent of Pitt’s population needs to vote on the referendum, which passes by a simple majority. According to SGB’s constitution, the constitutional review committee, which is appointed by a simple majority of the board, must propose any changes to the constitution. Robinson, a junior neuroscience and anthropology major and the president of Rainbow Alliance, said it is important to encourage inclusivity in organizations. “We want to make sure the language is as inclusive of all different identities and is welcoming to people who might not be typically represented within Pitt’s student body or even SGB,” Robinson said. Harun said she wants the constitution to reflect a diverse student body. “This year, what sparked [the constitutional review] was the idea of making sure we were doing what we could to be more inclusive, so we thought we should start with gender-neutral language,” Harun said. “Obviously, we’re becoming more progressive with changes in society,” Harun said. Robinson said while the committee will look at gender-inclusive pronouns, he is not sure what specific changes it will suggest. The Board also hopes the committee will review the GPA requirements for Board members and procedural changes, such as clarifications in how the Board will handle impeachments, appeals and dismissals, according to Harun. Harun said the changes the Board hopes to see are not a result of a specific problem. “These are just things we’ve learned from over the years that we want clarified so there’s not any questions about procedures in the future,” Harun said. Harun said she will meet with the committee to hear its suggestions later this week. In other news, following student requests, Board member Meghan Murphy announced that CSSD will place self-service printers for students in Chevron and Clapp/Langley Halls by the end of the semester. The Neuroscience and Chemistry departments are paying for the printers, which cost $5,000 each, not including the monthly service fee. On Monday, tickets for the second annual TEDxPittsburgh conference, an independently run program similar to the the national nonprofit TED Talks, will go on sale in the William Pitt Union. This year’s TEDxPittsburgh conference will take place on March 26. Board member Jacky Chen announced that Raymond Gastil, Pittsburgh’s director of city planning, and Janera Solomon, publisher of 1839 magazine, will speak at the conference. Gastil will join Kerry Tombs-Harling, a mindfulness therapist at UPMC, Dr. Michael Boninger, chair in the Department of Physical Medicine and Rehabilitation at Pitt and the director of the UPMC Rehabilitation Institute, and John Fetterman, the current mayor of Braddock and candidate for U.S. Senate. The Japanese Culture Society requested $2,647.48 to attend the Cherry Blossom Festival in Washington, D.C. The Board approved the request in full. Circle K requested $1,706 for a convention at Penn State. The Board approved $602 and denied $1,104. The Robotics and Automation Society requested $3,009.81 for a competition in Cleveland. The Board approved $2,962.23 and denied $47.58. The Resident Student Association requested $2,923 for a mental health awareness event. The Board approved the request in full.